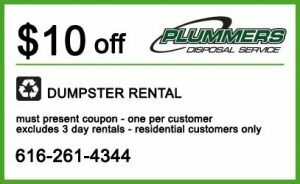 Plummer’s Disposal prides ourselves on our proven record of customer satisfaction. 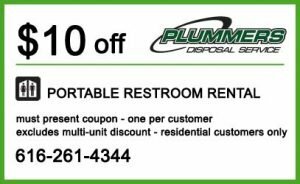 We provide world class service to special event, construction, industrial, and residential clients with a variety of products including portable restrooms, hand-wash sinks, restroom trailers, dumpster rentals, G.A.P. agricultural solutions, commercial and industrial trash containers and recycling resources. We provide prompt, clean, and professional service throughout Michigan. We are located in West Michigan and service all surrounding Michigan venues and needs throughout Grand Rapids, Byron Center, Holland, Grandville, Rockford, Caledonia, Wyoming, Middleville, Allegan, Walker, Kalamazoo, Alto, Lowell, Jenison, Zeeland, Plainwell, Otsego, Dorr, Kentwood, Cascade and beyond. You can rest assured and trust us to deliver the perfect solution. Plummers is to exceed our customers expectations for service product quality each and every time.